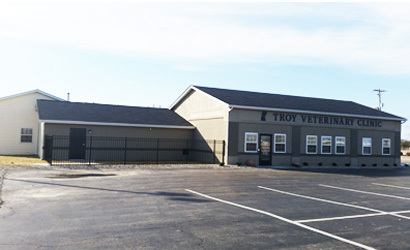 Open in August 2011, Troy Veterinary Clinic offers comprehensive health and medical care services for maintaining and preserving your pet’s optimal health. Led by Julie Mears, DVM, our friendly, well-trained staff of avid animal lovers will treat your pet with the compassion and care they deserve. Whether your pet is in need of a routine check up and vaccinations, surgical services or preventative care services, our staff is well trained to offer you a one-stop shop for all of your pet’s health needs. We also have an in-house pharmacy and referral access to specialists should your pet need advanced care or medications. At Troy Veterinary Clinic, we pride ourselves on a clean, friendly atmosphere so your pet, and you, will have the best experience possible from the moment you walk in the door to the moment you take your pet home. For your convenience, we have also recently added an online store, visit it here. Thursday: 7:30 a.m.to 5:30 p.m.
Saturday (see chart at right) 8 a.m. to 12 p.m.
Our Facebook Friends say. . .